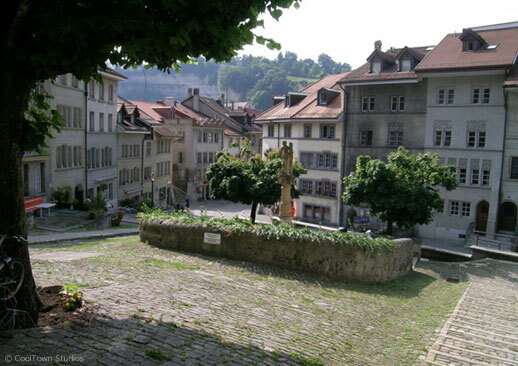 One of Switzerland’s best-kept secrets, Fribourg is a town of 33,000 on a forested peninsula bordered by the River Sarine, characterized by its pedestrian-only streets, cobblestone roads, quaint bridges, flowers everywhere and its innate human scale. Yet it’s a very modern, even cosmopolitan town as far as its shops, businesses and residents, aided by hosting one of the country’s most prestigious universities. Not surprisingly because of its prevailing picturesque, human-scaled character, Fribourg is known as one of Switzerland’s most amiable, easygoing towns. It has one of the largest preserved medieval centers in all of Europe, even more spectacular in that its located high above the turquoise river that winds around it. I didn’t get to experience the local culture deeply firsthand, but it’s the pedestrian-only areas where people seemed to want to be. The main pedestrian-only streets were full of outdoor diners and people strolling, while the numerous residential squares had a cafe or two with a few dozen outdoor dining patrons, and those seemed like the ideal kinds of places where you’d want to hang out several times a week.